The Chupp’s Piano Service Showroom in Goshen is proud to offer brand new Kawai upright, grand and digital pianos. As the only authorized dealer here in the Michiana region, we are proud to represent the Kawai name. The Kawai K-300 is part of the company’s K-Series of professional grade upright pianos. Built in Japan, this instrument measures 48″ in height making it the perfect choice for both home and studio use. The K-300 features the famed Millennium III Action with ABS-Carbon parts, extended length key sticks, a solid spruce soundboard, a hard rock maple pinblock and much more. Available in ebony, snow white, and mahogany in both satin and high gloss sheens. Contact us today to set up a private selection appointment to find out why Kawai pianos are some of the finest you can buy. The Kawai K-3 and today’s improved K-300 are among the most popular upright pianos ever built – with good reason! These professional grade vertical instruments measure 48″ in height and offer a superb level of control and a clear, powerful tone. Among the most advanced pianos on the market today, Kawai upright pianos are also well known for their incredibly durable build quality and lasting stability. The Kawai K-300 includes the famed Millennium III Action with ABS-Carbon action parts. The use of ABS-Carbon makes the action tremendously strong and consistent. This material is virtually impervious to humidity swings which allows the piano to stay in regulation much better than traditional wooden parts. The Millennium III Action combined with extended length keys allows for a confident, responsive touch. The steel, machine threaded tuning pins are driven into a multi-laminated pinblock of North American hard maple. We have found that Kawai pianos reliably stay in tune due to their high attention to detail during the manufacturing process. The heart of the piano, the K-300’s soundboard is constructed out of clear, quartersawn, solid spruce. The board is expertly tapered to maximize the tone producing capabilities and the bridges are constructed of hard maple for stability and tonal transfer. The underfelted hammers are pressed out of the highest quality felt and are mounted on lightweight mahogany moldings for optimum responsiveness. The K-300 produces a full, warm quality of tone that does not sacrifice clarity. There is a reason that more and more pianists are choosing Kawai instruments as their preferred instruments. Visit our store in Goshen to view our in-stock Kawai instruments. Each of these pianos is fully prepped and come with a Ten Year Full Warranty. Kawai has one of the best service records in the piano industry and we see these pianos perform well in even the harshest of institutional settings. Compared to a Yamaha instrument, a Kawai piano offers a warmer, more pleasing tone that is still filled with clarity. The Kawai K-300 is the upright piano we recommend for both home student practice and institutional use. NEW, USED & RESTORED PIANOS FOR SALE – GOSHEN, IN. 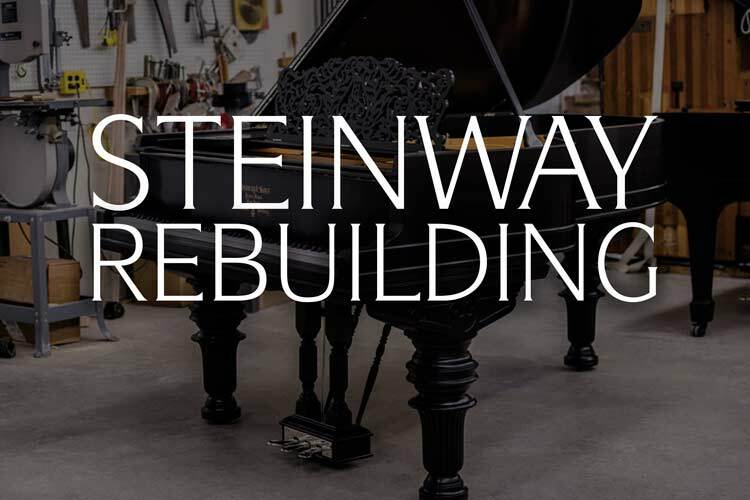 Our Piano Showroom in Goshen and our Rebuilding Facility in New Paris, IN. 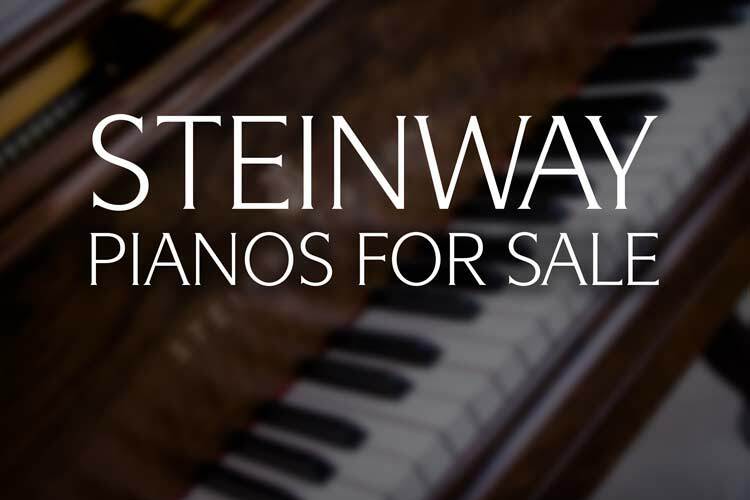 offer a wide selection of fully restored Steinway, brand new and used Kawai and pre-owned Yamaha pianos for you to select from. We are happy to open up both of our facilities for private selection appointments to help you select the piano that is right for you. Our facilities are located conveniently between South Bend and Fort Wayne. 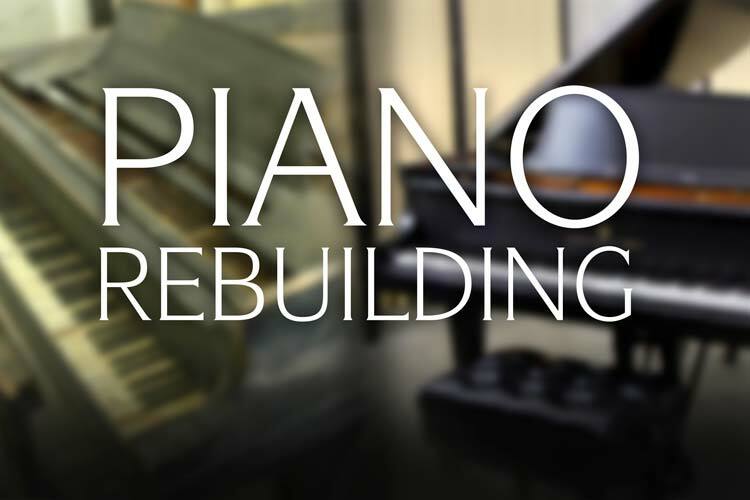 We specialize in the full restoration of vintage, concert level grand pianos. Don’t live near our showroom? Don’t worry! We regularly ship our pianos across the continent at an affordable price. 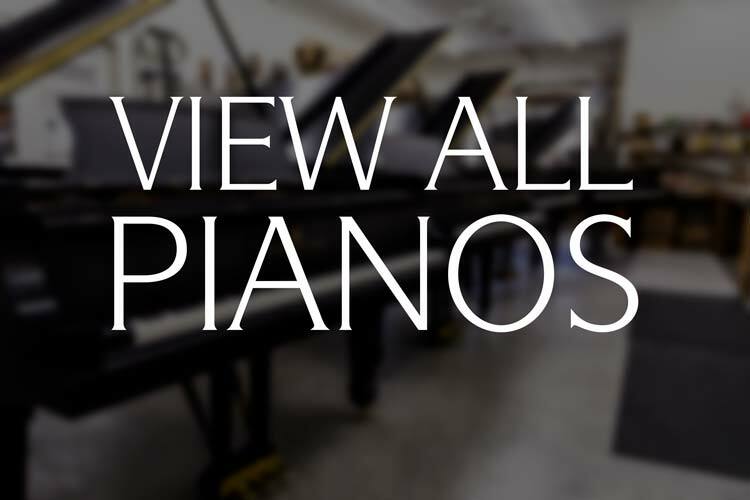 We have over forty years of experience in the piano industry and are ready to help serve your piano needs. Kawai NS-20A Upright Pianos are among the very best professional grade instruments ever built by Kawai. Measuring 49 1/4" in height, this instrument is in a gorgeous polished ebony cabinet. Featuring a solid spruce soundboard, extended length keys, premium virgin wool hammers and much more, this piano is a great choice for those seeking only the highest in piano quality. Includes a matching bench. [Interested in this piano? Contact us today!] NEW PRICE: $3,650.00! The Kawai GE-30 Grand Piano is one of Kawai’s most popular offerings. 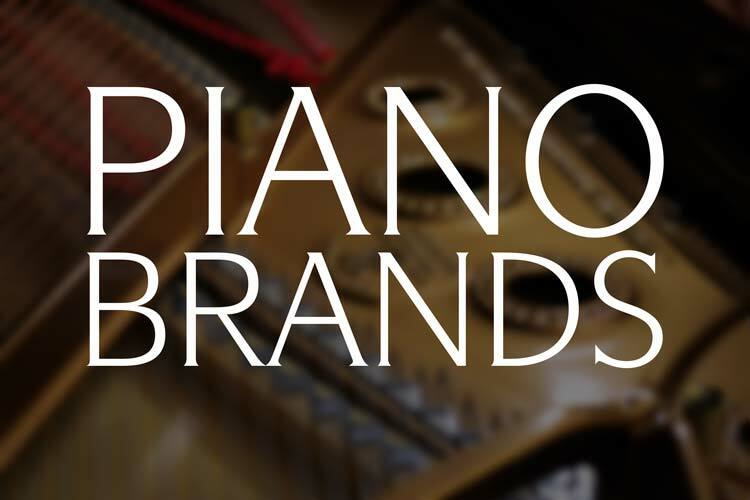 Measuring 5’5″ in length, these pianos offer high performance and lasting durability. This Kawai is in like-new condition and is available at an incredible price! Set up a private selection appointment to play this piano and receive a special sale price. Contact us today. The Kawai K-200 is part of the company's K-Series of professional grade upright pianos. 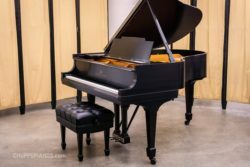 With an outstanding tone and touch in a 45″ design, the K-200 offers the dependability and character needed to please any performing pianist from the novice to the seasoned professional. 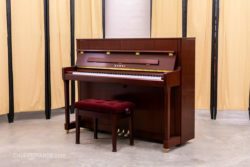 The K-200 is priced at a very reasonable price and it is a great choice for anyone looking for a high-quality upright piano. Available in ebony, snow white, and mahogany in both satin and high gloss sheens. [We currently have this beautiful satin mahogany K-200 in stock.] Contact us today to set up a private selection appointment to find out why Kawai pianos are some of the finest you can buy. Build in 1910, this Baldwin Model C measures approx. 6'3" in length. The precursor to the later Baldwin Model L, this piano boasts the quality of tone that is expected of an American-made Baldwin Grand. This instrument was recently traded in and is in excellent condition. Currently featured in our New Paris, IN Piano Rebuilding Facility. Error: Error validating access token: Session has expired on Thursday, 10-Jan-19 19:00:02 PST. The current time is Wednesday, 24-Apr-19 23:03:11 PDT.